Buckeyes are the confectionary for the state of Ohio. They resemble the nut of the Ohio buckeye tree. It's a confection made from a peanut butter fudge mostly dipped in chocolate, leaving a circle on top visible. 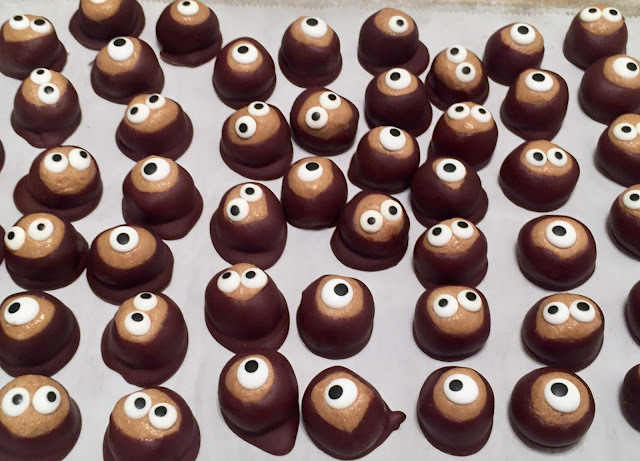 To make them festive for the season, I topped them with candy eyes I purchased to a cake and candy store. I think they look adorable with the eyes - more adorable than spooky. These are homemade Halloween treats that are easy to make and everyone loves, if they like peanut butter. In this batch I added in a little bit of the fall spices (cinnamon, nutmeg, cloves, allspice) which created a little bit of warmth and depth, but not necessary. Butter, Salted, 1/2 cup softened at room temp. Combine peanut butter, butter, vanilla and salt in large bowl. Beat with an electric mixer on LOW until blended. Add 2 cups powdered sugar, beating until blended. Beat in additional powdered sugar until mixture, when shaped into a ball, will stay on a toothpick. Shape into 1-inch balls. Refrigerate. Place chocolate chips and shortening in microwave-safe bowl. Microwave on MEDIUM for 30 seconds. Stir. Repeat until mixture is smooth. Reheat as needed while coating peanut butter balls. Insert toothpick in peanut butter ball. Dip 3/4 of ball into chocolate, leaving top uncovered to resemble a buckeye. Remove excess. Place on wax paper-lined tray. Remove toothpick. Place candy eye(s) over holes. Refrigerate until firm. This is part of Food Network's Fall Fest. Check out The FN Dish and the family of bloggers' recipes. The fall theme we're focusing on here are Halloween treats. On twitter, we're tagging #FallFest.